The quilting is done! I used all the moments available to me yesterday to quilt. 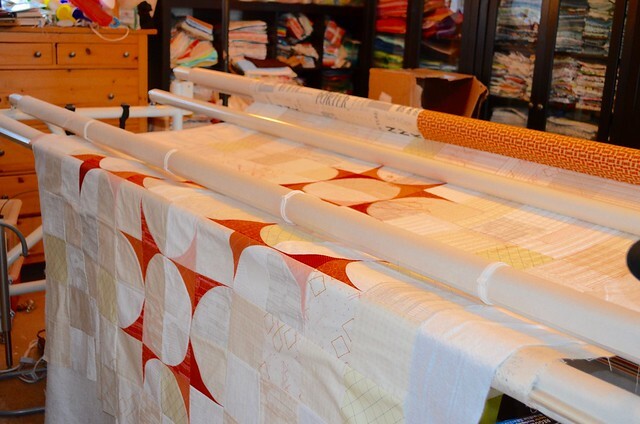 Today I will trim and start binding this quilt. Also I have to mend in all those thread ends from the thread breaks - a couple of them are from bobbins emptying too. Mostly I was able to just transition from one quilting area to the next without cutting the thread. 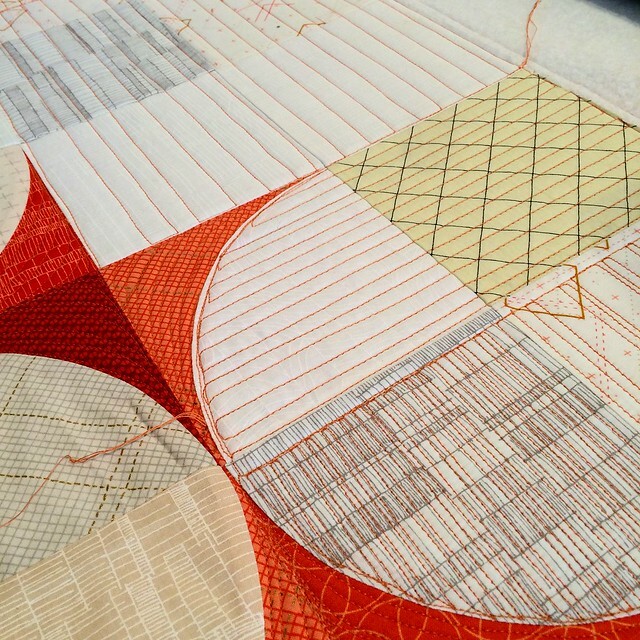 I am sure there are several names for this ariel view, linear graffiti, industrial line style of quilting - these are mine. It is all freehand - no rulers, no computer, no channel locks used on my longarm. The lines wobble, the spacing varies, the turns and travelling are often jiggly - and it gives an overall organic, industrial feel. Sort of like a warehouse or a rough brick wall. It is fun and easy to do on any kind of sewing machine, maybe you will give it a try too. It is exactly the look I intended. I am pretty certain that washing and drying will also improve it and the wobbles and jiggles will melt into the design and the planned texture will be the feature. We will know soon. 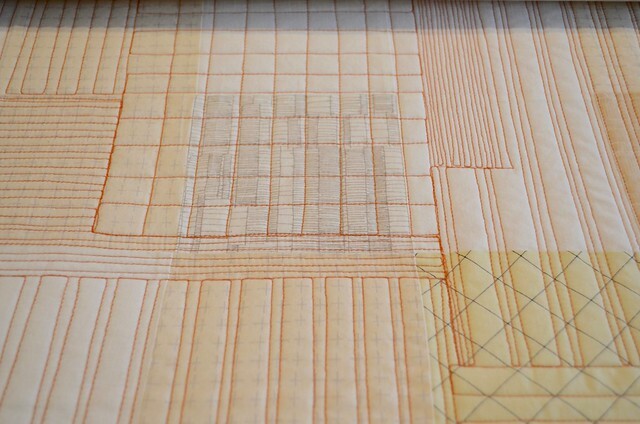 I realized that I could also go back and add a bit of matchstick quilting, so I did that in a couple of places. 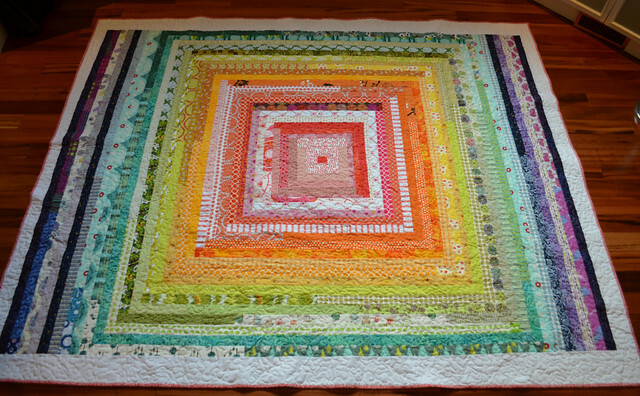 I was hesitant to add too many really dense patches as that might affect the drape of the quilt. 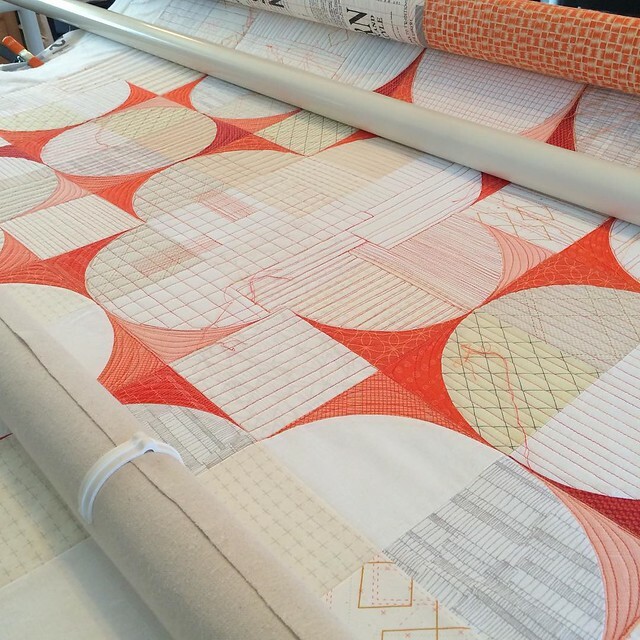 If you were part of the instagram cheerleaders, thank you and thank you for not being tired of seeing photos of the quilting of this project. 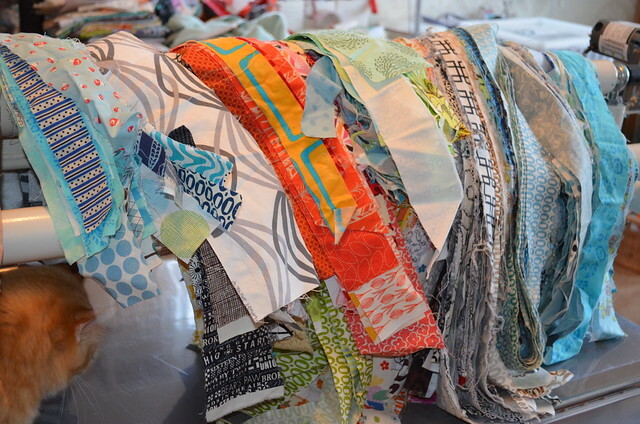 And yes, there are many Carolyn Friedlander fabrics in this quilt, along with others. 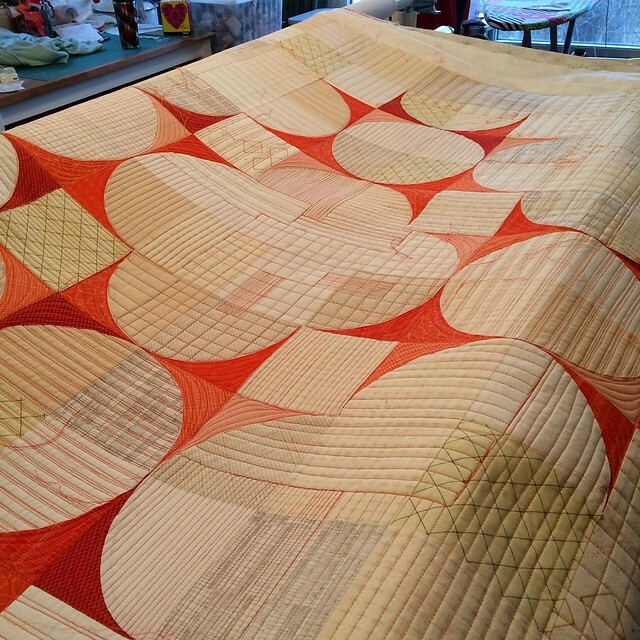 Yes, the quilting was inspired by Carolyn's fabric, her work, her quilting in her book, and also inspired by others, including Krista Withers - I have been lucky enough to take classes from both of these talented women. 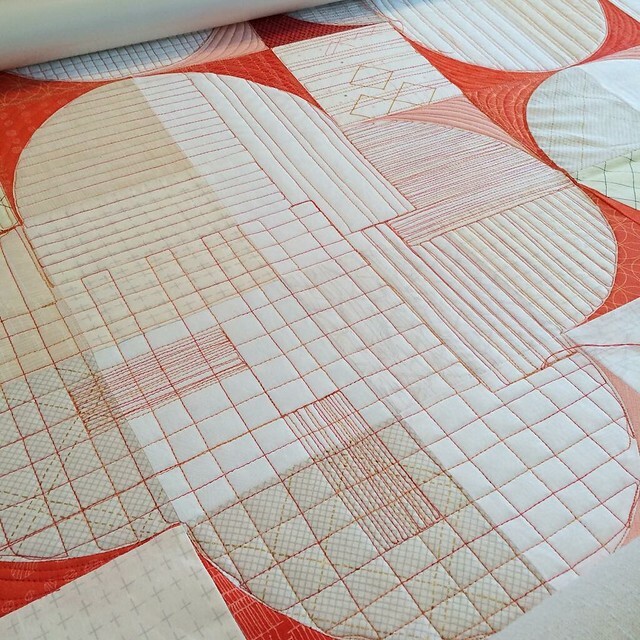 I have quilted like this many times before, it is also just my own journey to use straight lines for quilting because I love them. Today it is binding, mending threads and I want to work more with my scrap boxes too, and maybe some other project will call my name. Oh and there are the chores I neglected yesterday, sigh. Here is my quilt this morning, just waiting for me to get back to it. I was quilting last weekend and then a week of no sewing. I am quilting mostly lines, free hand - no computer, no channel locks. They are intended to be industrial, with some wobbles and imperfections. It is best to intend what you do and I have loads of imperfections - good thing I love them. Too perfect is not my thing on a quilt. On the orange bits I am sort free hand echoing the curve. You can see my nemesis in all this free hand quilting, going around the low volume curved edges - totally industrial wobbly. I am adding several passes to show that this is intentional. 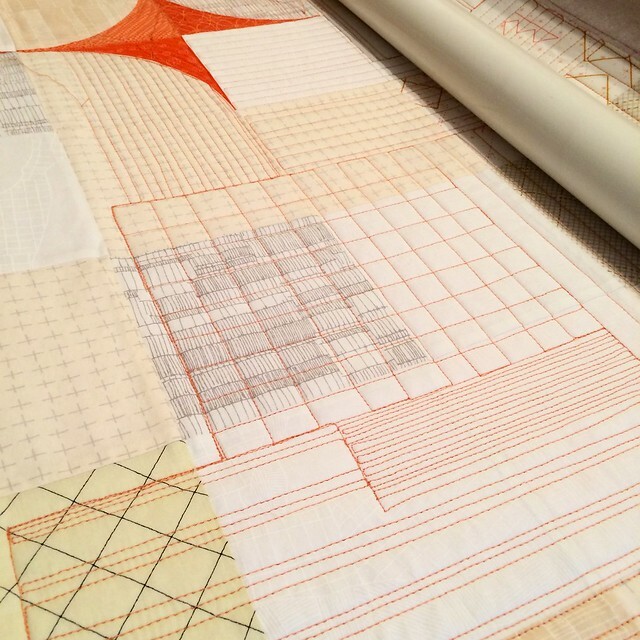 This ariel view sort of straight line quilting is something that I love and have done before. I was inspired by many folks, but especially Krista Withers and Carolyn Friedlander. In fact it looks something like Carolyn's fabrics too, but I first noticed it on the quilts in her book. I have had a lot of thread breaks so far. I am using 100% cotton Superior Threads King Tut and if I turn that right to left corner too fast it just breaks at the needle. I will mend in those ends later and no one will be the wiser. 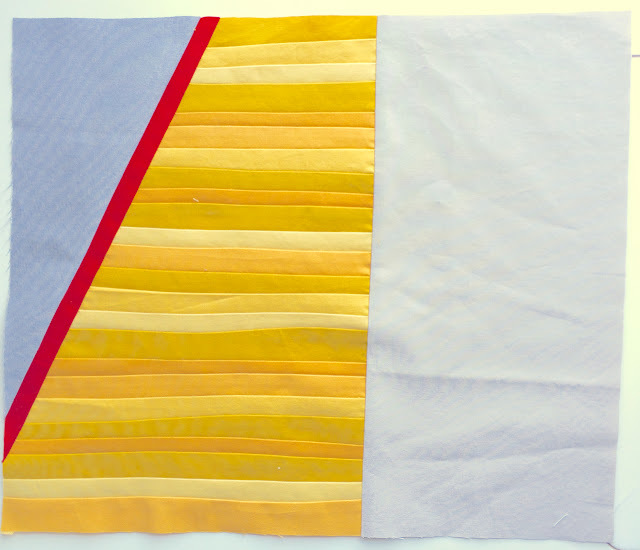 This style of quilting uses a lot of thread too, I am thinking I might have to change to another spool for the middle as I don't have enough of the one thread for the whole quilt and then can come back to this one for the bottom third - again, my hope is to make these things intentional, even retroactively. I am planning to quilt today, and do some chores too, and take a walk I hope, I need to get back into walking fitness for QuiltCon - are you going? Welcome to if you're shopping.... On Fridays or Saturdays like today, I share news from my sponsors, in case you want to do a little shopping, or even window shopping. 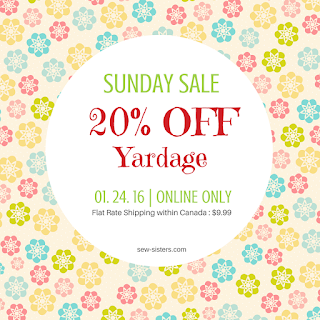 Just in at Sew Sisters Quilt Shop is having a 20% off one day sale, don't miss it! There are some details here. 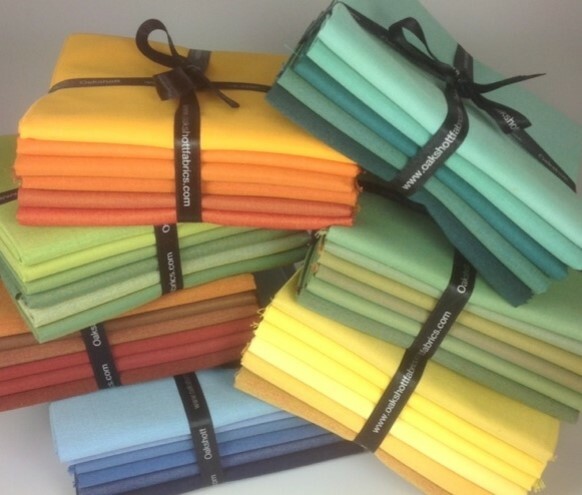 Fluffy Sheep Quilting has Skinny Bolt Sale with 40% off if you buy what is left on the bolt! Mention monochrome and most people immediately think of black and white or grayscale colour schemes. Think again! 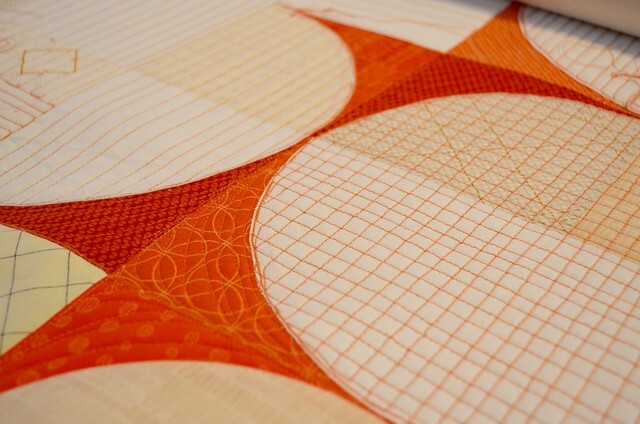 designing with one colour, whilst producing a soothing effect which is easy on the eye. 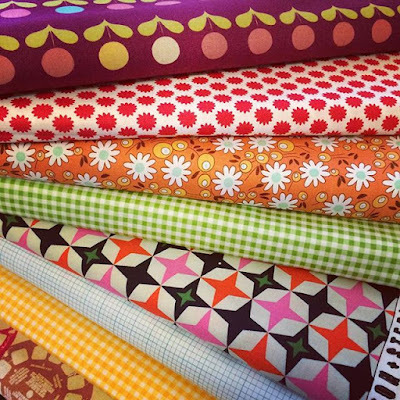 Mad about Patchwork has this beautiful Basic Mixologie Fat Eight Bundle and many other new fabrics in. 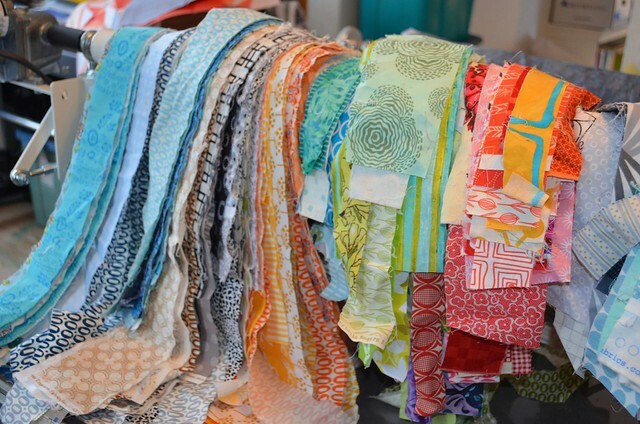 Fabric Spark has a lot of new fabrics in. I am smitten by these new Echino prints! Green Fairy Quilts has just received 9 new Moda lines and they are all on sale with free USA shipping. 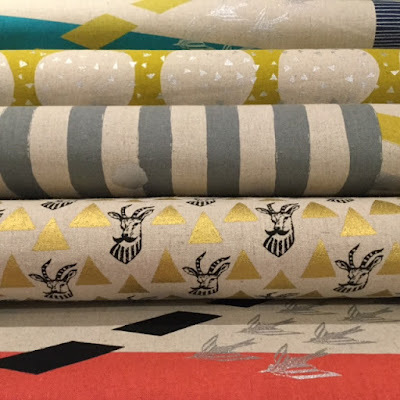 The Fat Quarter Shop has many new fabrics in, and I am going to have to get some of Cat Lady by Sarah Watts for Cotton + Steel. I want to especially focus on sharing my progress on projects this year, not just finishes. I occasionally sit down and make a quilt in a weekend, but it is far more often the case that a quilt takes me months and months. In part because I work on many projects at the same time and in part because I have a full time job, a full time family, pets, friends, other hobbies, exercise (well I am working on making that one a priority), etc. just like everyone else. While you might have caught some of my progress posts on Instagram, I expect that many of you don't follow Instagram or maybe you are like me, you read what is there in the few minutes a day you make for Instagram. 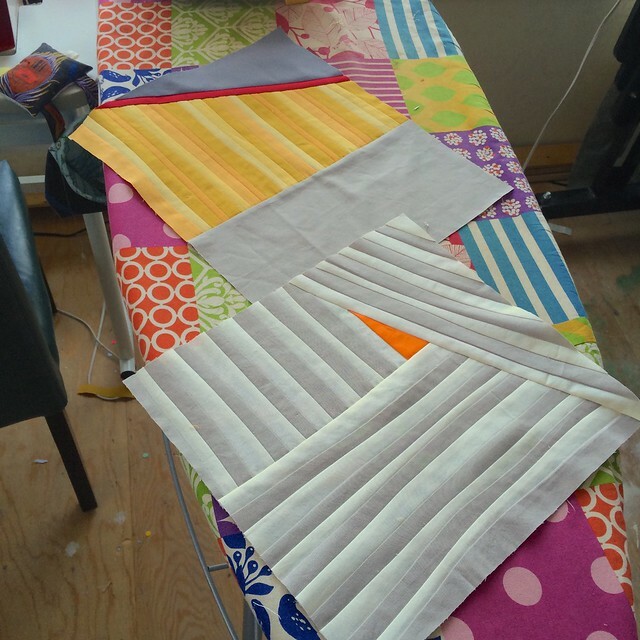 I like to see Instagram as immediate inspiration and connection or as a way for connection while I am actually sewing. But I don't have time to read back and miss almost everything everyone else posts. I have been making great progress on the Lion Jungle Abstractions quilt - pattern is by Violet Craft. 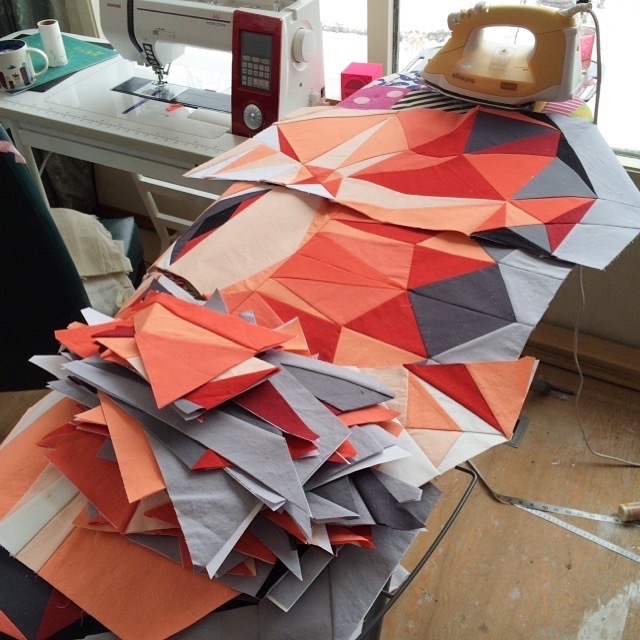 I have finished making all 126 or so pieces and now I am back to putting the chunks together and then adding them to each other. I find this part of paper piecing tedious and I get poked by the pins a lot. But it is very rewarding as the pieces come together and make the final image. Paper piecing a 60" square quilt is a lot of paper piecing, so I set this one aside often. 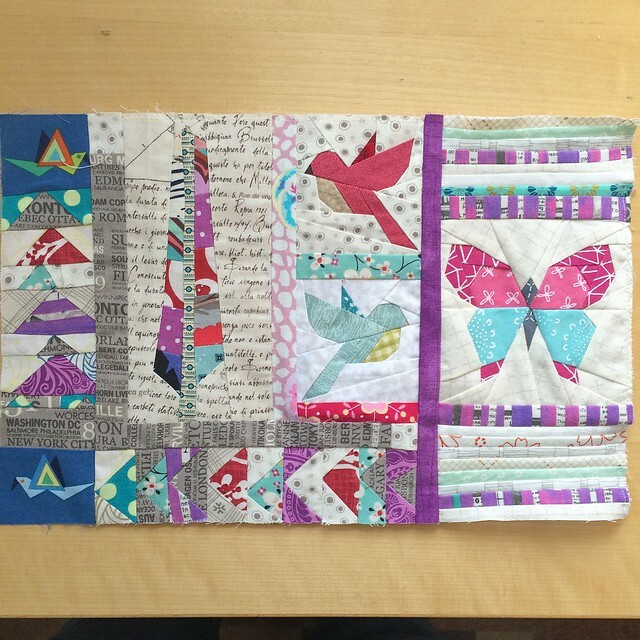 My friend Becca from Sew Me a Song and I - along with Marci from Marci Girl Designs, began Carolyn Friedlander's Collection Quilt Block of the Month a long while back. We figured this beautiful modern appliqué project was perfect to learn and hone a new skill. Then Becca and I stalled totally with the busy summer and fall, although Marci has been working away while she is out and about as a passenger in her husband's truck - she is on block #4 already. This year, my spouse and I have agreed to have more movie nights this year, where we actually sit together and enjoy a show - we are both often involved in our own hobbies. This is perfect project for that, and Becca and I challenged each other to sew at least 10 stitches on it this week to get out of the slump. Then, I challenged Marci to get her's out of the truck for more work too. And I even stitched my 10 stitches and more. I am about half way through this #2 block. 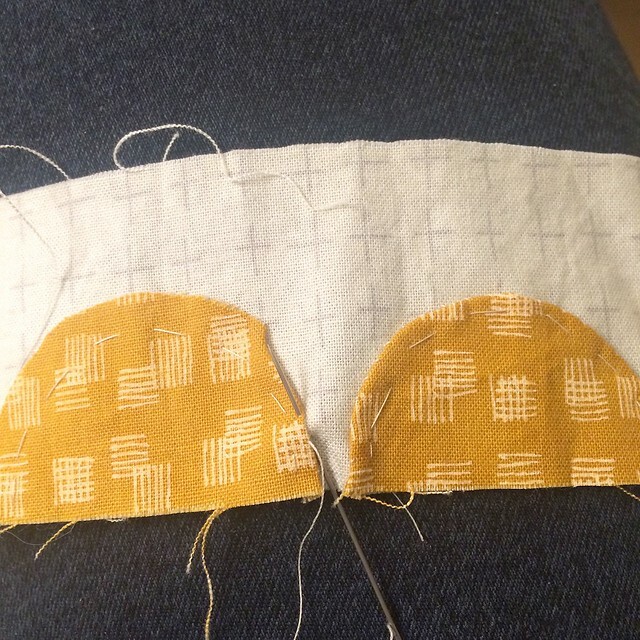 I continue to love Carolyn Friedlander's approach to appliqué - it allows one to easily create smooth curves. 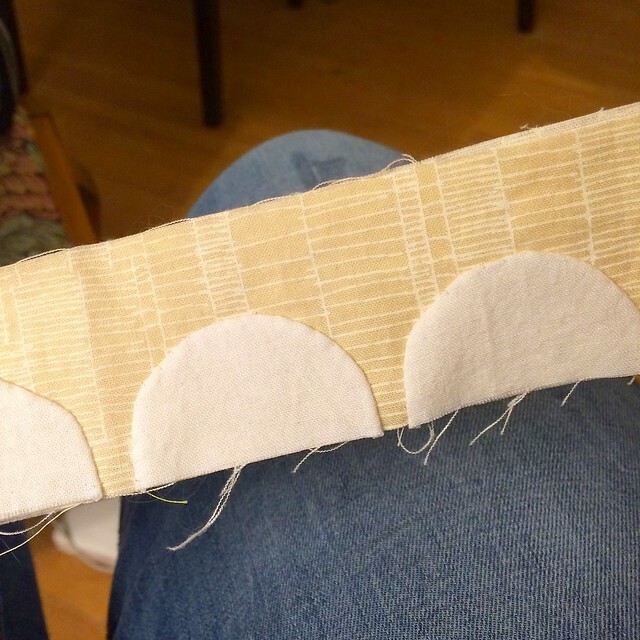 I have learned that I don't really need contrasting thread for the basting, so I can baste some bits, appliqué some, and repeat without fussing to change thread. I've also become pretty good at eyeballing the quarter inch line for the basting, it just takes practice. The lesson for block #2 is outside curves, and I think I am managing nice and smooth curves. I had put both of these projects on my Q1 FAL list too, so I even feel good about moving along on that list. 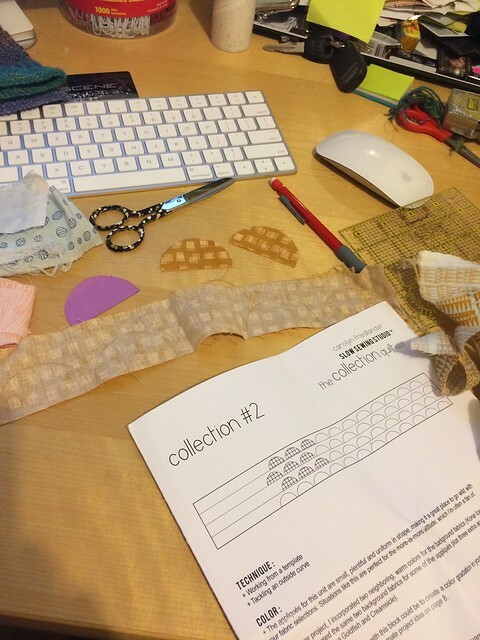 I am linking with Lee at Freshly Pieced for some WIP community and inspiration at WIP Wednesday. 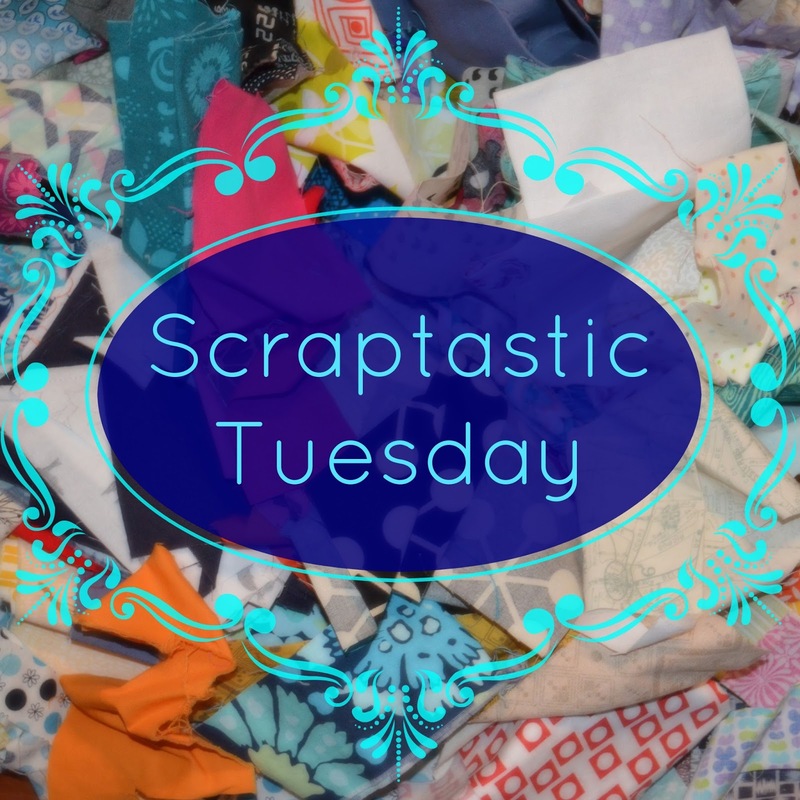 Before I tell you about the winners of the January Scraptastic Tuesday Linkup, I'll share my scrappy progress. Last week I said I would try to organize my scrap boxes into strips and squares leaving the other pieces in the boxes for improv sort of work. Of course I put that off until last night. It took an hour or so but I went through all the boxes of prints and took out the strips of any width that were clearly cut as a strip. I was astonished to see all these strips. 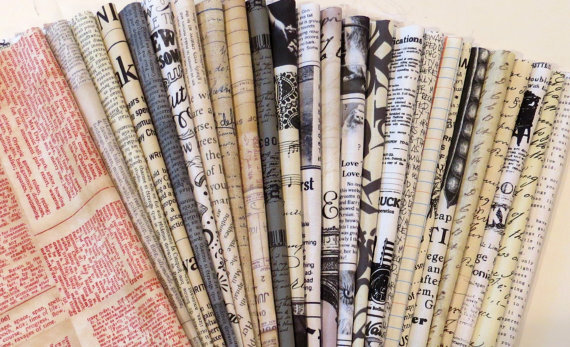 I am going to look around and see if I have a jelly roll or two hanging about ignored to add to these as well as I am pretty sure I have at least two. Do you have any other suggestions? I am going to continue with my plan from last week to pull out the already cut squares - I just got focused on the strips last night. 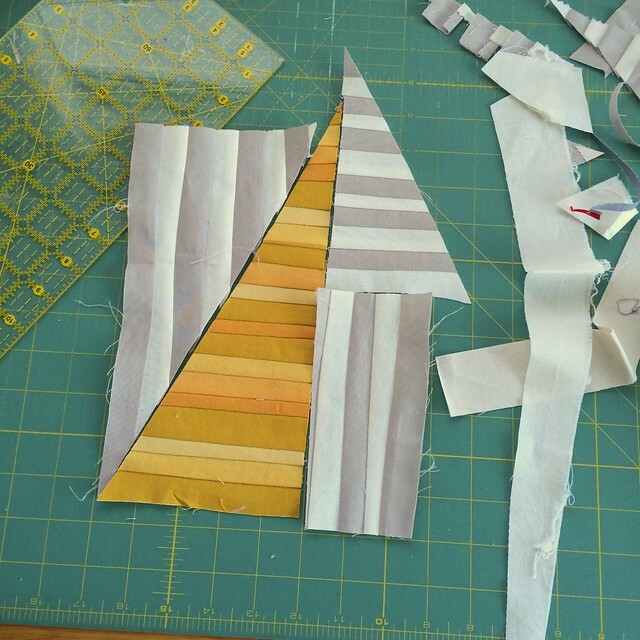 Then I have to decide if I will also cut squares from the remaining scraps or not. I have in mind to make a rainbow pixelated style quilt, it will depend on how many squares I find and make. Congratulations to all our winners and thank you to everyone who linked up for the lovely inspiration. I will be sending emails shortly to get the prizes to people. Do go and take a look at the various projects linked up in January (go here) if you have not yet done so, there is a lot of scrappy inspiration. Please plan to join Nicky from Mrs. Sew and Sow and I for February's Scraptastic Tuesday Link up on the second Tuesday in February which is February 9, 2016. 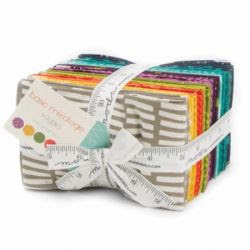 This is the solids inspiration based bee that Stephanie and I dreamed up and invited some talented friends to join. 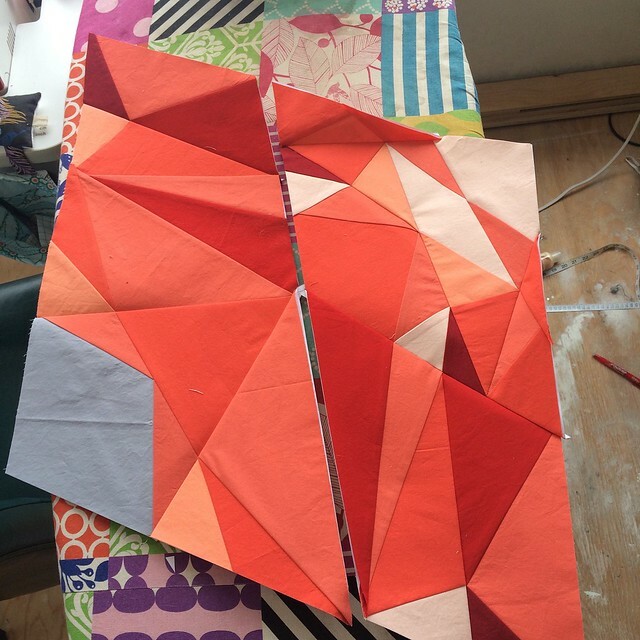 You will see our approach mentioned here by the Modern Quilt Guild to explain their Charity Quilt Challenge for this year. You can find us on instagram as #beesewcial and if you want to be inspired by our themes, post your photos under #inspiredbybeesewcial so we can find them. 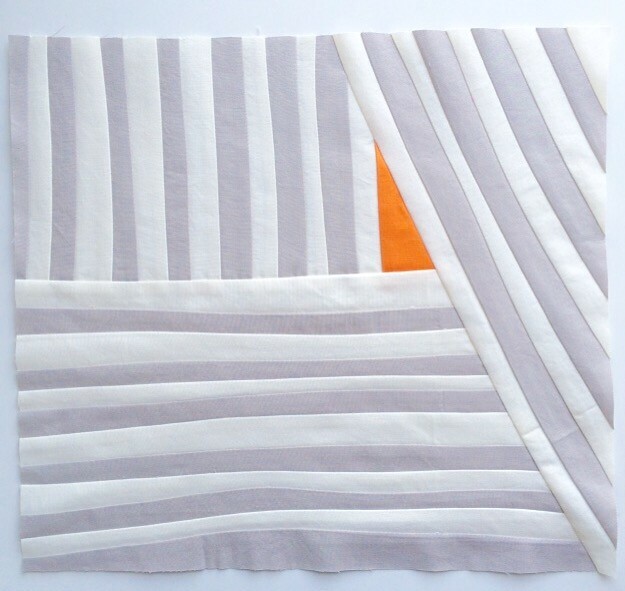 Stephanie asked us to use the theme linear using mustardy yellows, greys and whites with a pop of a warm colour. I cut all the seams (except the outside trimming and the insertion of the pink-red line) without rulers for these blocks as I wanted them to have the soft feel of improv, rather than the stark feel of measured stripes. I did aim for pretty straight, and I am getting better at free hand cutting it seems. On the first block - up at the top - I am thinking that it might be better with that right lighter grey side trimmed to about half, but I am going to leave it to Stephanie to decide that as she pieces the irregular sized blocks she receives together. I'm going to send her the left over bits too in case they are useful. I ruler cut the strip of rich pink-red to really emphasize the angle and the pop of colour. It gives one either a sense of perspective or intrusion, that pink line supercedes the yellow lines, overpowers them, has priority - is more urgent - and you might wonder why - well whatever you might see, it mostly just felt interesting to me. This is my second block. I have to say that I am totally smitten with it. The light gray and snow white together look like a pencil drawing. 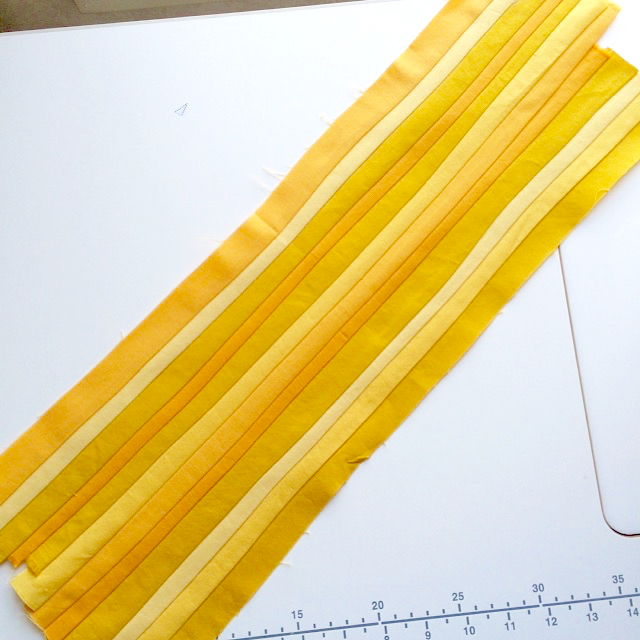 After I made the first set of strips, I had to leave out the mustardy yellows all together. And my warm pop became orange, to keep that softened tone. This second block sings to me and I hope to be able to make another similar but quilt sized. I would love to see it on my - or even more likely, on one of my kids' beds. I find it interesting that I am less inclined to "interpret" or "explain" this block to you. It just feels right to me and I assume you will feel the same - which I also find interesting. Both blocks are around 14" squarish, Stephanie can trim the if she needs to. I don't think I shared earlier my other group project, the Pip Mini Quilt Round Robin, before I mailed it off earlier this month. I added the butterfly to the right of the purple line - I know I have shown you just the butterfly before. After a lot of humming and hawing about how to add the butterfly on to piece, I decided to frame that butterfly with the skinny strips and particularly more of the purple that you see in the flying geese that Dee added. 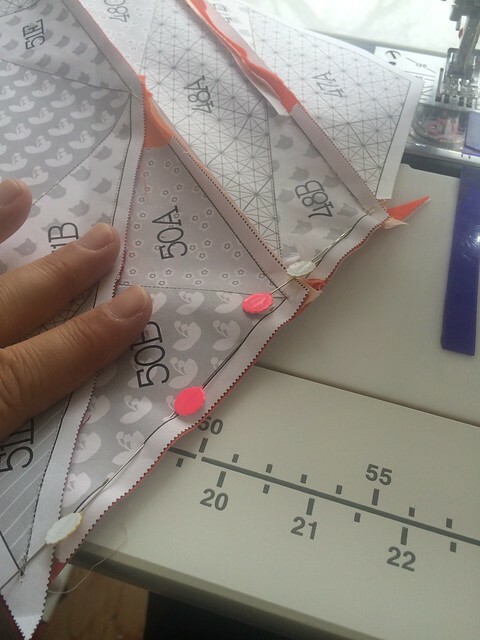 The decision of how to add this butterfly on was hard as my decision has made the quilt wider than tall, but the next person, Susan, could always change it when she gets it for her turn anyway. I am learning a lot in this group too. And, if you are a timely reader, there is 5.5 hours left before January Scraptastic Tuesday's link up closes - it closes at 10 pm MST today (Monday, January 18) so join us if you have not yet done so, and Nicky and I will have the winners of the great prizes tomorrow.